Cut beeswax sheets into 8" squares, add herbs and essential oils, place a wick and roll them up. We use organic beeswax dyed with non-toxic dyes. 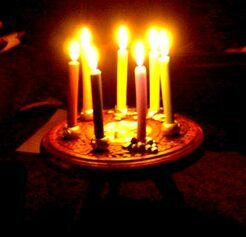 The candle colors, herbs and essential oils are selected to correspond to each Sabbat. There are no hard and fast rules for the choice of colors or herbs or essential oils. There are many choices for each Sabbat, and in the end it's best to go with what feels right to you. We grow the herbs and flowers that we add to the candles. They are harvested on each Sabbat, then dried and saved until needed. We decided years ago that there's just no sense in purchasing exotic plants and herbs for magick. We are witches, and we use what is locally available to us whenever we can. I'm quite sure that the wise women of old didn't surf eBay for eucalyptus leaves. There's always a local native substitute for all herbal magick. Once all the candles have been made, we enchant them with Coven energy. At Candlemas we Bless and Consecrate them in our Ritual Circle. Autumn Storm - A note I would like to share about these so that others can learn from our experience is, if you wrap the candles in tissue paper other then white, you will find that the colour from the paper can bleed through onto your candles.